As a restaurant owner, you must know that as soon as any holiday would roll around, people will be flocking to restaurants to celebrate. If you want to make sure that your restaurant business will be able to grab this opportunity to earn more than usual, you should already figure out and finalize the traditional holiday dishes that you should serve on those holidays and make sure that you layout it in an orderly fashion using a menu, specifically a holiday menu. If you have no idea how to make it or if you have difficulties in designing one, do not bother worrying for we have already have you covered with the holiday menu templates and examples provided in this article. 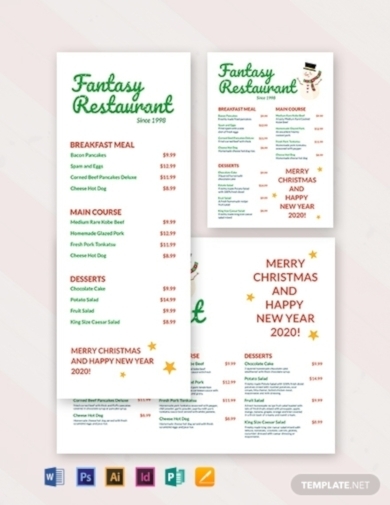 If you are looking for a versatile template that would suit whatever holiday celebration, make sure to download this holiday menu template that can serve as your jump start to menu designing. 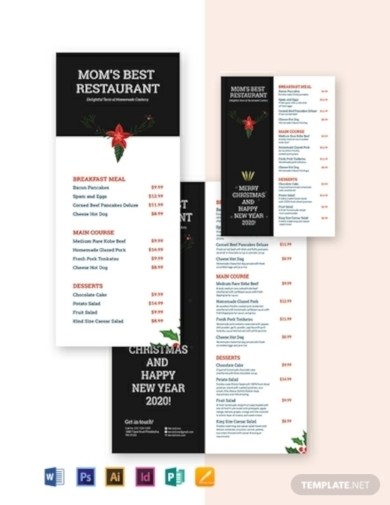 Since holiday menus aren’t bound to stick for a long time especially if it’s only being celebrated for a day, using this menu template is just perfect because it does not make you feel overwhelmed with the possible spaces where you will find the need of adding unnecessary menu items just to fill it up. In fact, its layout is divided into two where the one-half may contain your logo, your contact information, and your holiday greetings while the other half should contain your holiday menu items. Are you currently seeking for a one-of-a-kind restaurant holiday menu that will surely deliver satisfaction to your customers? 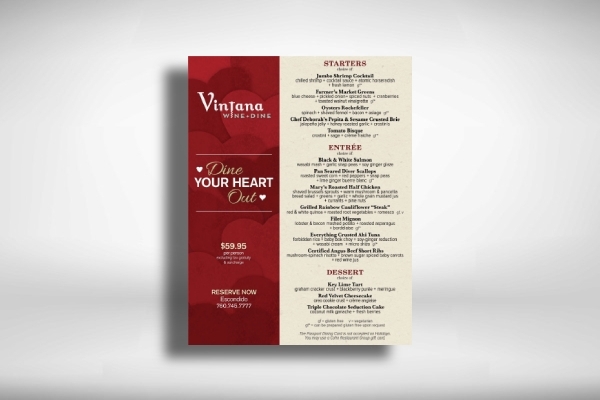 Look no further and download this restaurant menu template that guarantees your customers a quality service from your restaurant business. By making use of this template, you will serve nothing but the best type of menu content that will definitely work for you, particularly for the goals you have in mind for your business. Aside from that, this template also comes with an impressive and high-quality design elements that will surely fit with whatever type of restaurant business you are running. 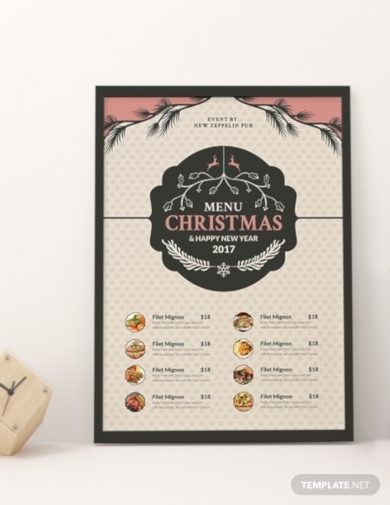 Is it still your first time to attempt at designing a holiday menu for your restaurant business? If yes, then you must be feeling overwhelmed right now, especially that there are holidays being celebrated almost every month. However, you shouldn’t be feeling that way because you can always make use of holiday menu, such as this simple holiday menu that can certainly help you in getting started in no time. 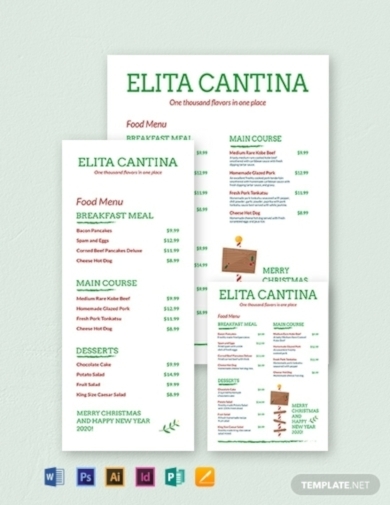 This template contains a really simple layout that you can make use of for whatever kind of restaurant business that you run, be it a cafe, a fast casual, or a pub. And aside from that, you can also customize this template however and whatever way you want it. The Christmas season may still be far but this does not mean that you cannot prepare ahead of time given the fact that this season is perhaps the longest season that quite a number of people would love celebrating. And to take advantage of the longevity of its celebration, you have to make sure that your restaurant business will be able to benefit from this by providing a Christmas holiday menu to your customers. Aside from that, also make sure that you would incorporate traditional Christmas food such as ham, turkey, fruit cake, and pudding that will surely put your customers into a long-lasting festive mood. After days of abstinence and fasting, people will really make sure that they will make up for it especially during the celebration of Easter. This is why you must never miss out on this opportunity where your restaurant business can make the most out of this holiday by providing an Easter holiday menu similar to the given example above. In your Easter menu, be sure to incorporate classic Easter dinner that features glazed ham, cheesy potatoes, and, of course, deviled eggs. 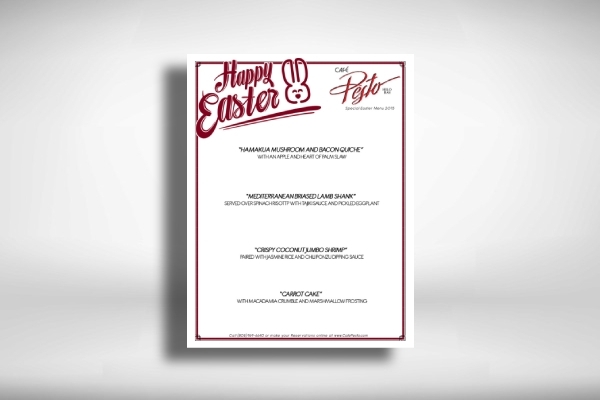 Whether you would want to create either an elegant or simple Easter menu, we have already provided a menu example that will serve as the best source inspiration for when you will be creating a menu for your own business. The celebration of Mardi Gras or Fat Tuesday is known for festive events, various merry-making activities and, of course, the food and drinks that are being served during this holiday. Mardi Gras is the last day before Christians all over the world would start commemorating the season of Lent, which is a season when Christians would fast and abstain from eating (particularly animal meat) and drinking lavishly. 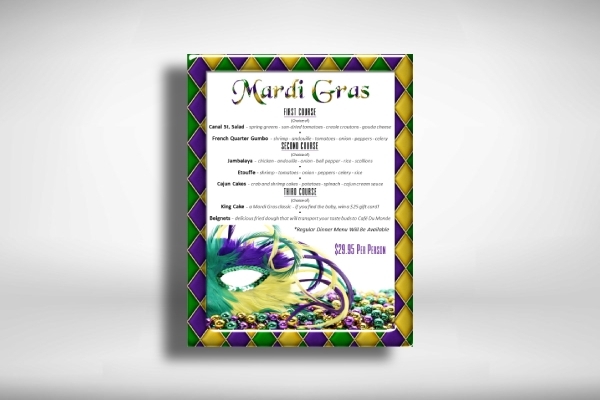 You can participate this holiday by providing your customers with a Mardi Gras holiday menu with menu contents that will indeed enable them to join and be a part of the celebration. 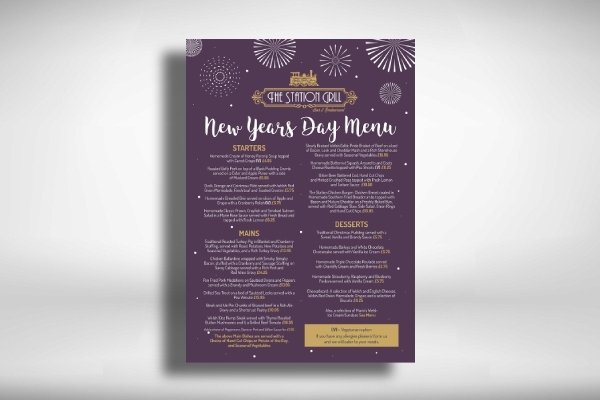 Allow people to celebrate and welcome the new year by providing an exclusive New Year’s Day menu. If you have no idea on how to create one, you can always refer to this menu example in order to get an idea on how such type of menu is being decorated and designed. Take a look at its menu contents and you may see that they made use of the different courses of a meals namely the starters, the main course, and the desserts. 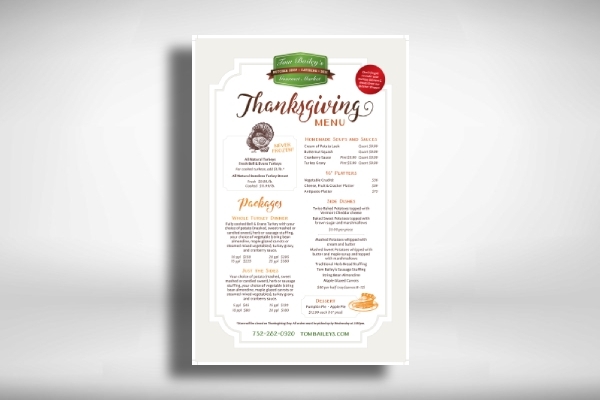 You may make use of the same layout to your own holiday menu but be sure that you add your restaurant business’s branding into it. 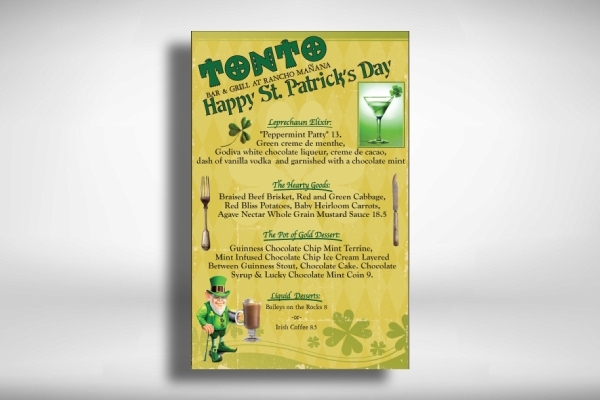 What’s a Saint Patrick’s Day celebration without having a Saint Patrick’s Day menu? During this holiday, it is ideal that you should serve Irish food, particularly St. Patrick’s Day traditional dishes, such as a “full Irish” breakfast that includes bacon, sausages, wheaten bread, eggs, Fadge, and the famous Boxty; the traditional corned beef and cabbage combo; and, of course, Ireland’s famous shepherd’s pie. Aside from the menu’s text contents, also ensure that its design elements will be able to show symbols (leprechaun, shamrock, and the color green) that are related to the Saint Patrick’s Day celebration. Before the holly, jolly, Christmas season would roll in, Thanksgiving is being celebrated first. While most families would prefer to celebrate at home and cook homemade dishes for this holiday, there are still some people who could no longer spare some time to actually cook dishes of their own. And with that, you can never go wrong in providing this Thanksgiving holiday menu that will surely benefit your customers who are constrained from doing what’s traditional. However, this does not mean that they can’t experience the traditional. And you can help them so by making sure that your Thanksgiving menu contains the traditional dishes that are being served during this holiday such as stuffing, mashed potatoes, sweet potato casserole, bread rolls, cranberry juice, and, of course, the famous Thanksgiving turkey. With all the couples celebrating around the world during Valentine’s Day, your Valentines’ Day event promotion and marketing efforts will surely not go to waste, most especially if you already have a Valentine’s Day holiday menu prepared beforehand. And if you unfortunately don’t, don’t fret either because with the given Valentine’s Day menu given above, you will no longer have a hard time in looking out for an inspiration to get from when you will finally be designing your own menu. What you have read and seen above are just among the best holiday menu templates and examples that you can find across the Internet and we hope that you were not able to miss out from this opportunity by downloading these now. Do take note that these examples and templates can be edited using various editing software applications that you are surely familiar with such as those under Microsoft Office Suite and Adobe Creative Cloud.